Why I disappeared from WJTV in Jackson, Mississippi. I pray that by sharing my experience, it helps news corporations understand our responsibility to America. Many news stations were created in the 50’s and 60’s when America was segregated. At that time, the news stations did not seek to uplift and educate Black people but hold us back. Even in 2019 news stations are still working to desegregate. Why I filed a complaint with Nexstar. Under the direction of my mentor, I filed a complaint with the HR department at WJTV the CBS station in Jackson, Mississippi. I stood up for myself because I knew WJTV was working to build a case against me and I wanted to protect my family. I also wanted our parent company Nexstar to be aware of the problems I faced as a young black mother while collecting their paycheck. WJTV knew my accolades, that’s why they hired me. I have almost a decade of professional news experience on morning teams across the south and midwest. I also have a Masters in Television specializing in research and I graduated from Alcorn State University located about an hour from the capital city. I have resolutions from both the State of Missouri and the City of St. Louis honoring my work as a reporter. I was named best reporter by the Riverfront Times, and St. Louis Magazine. Delux Magazine named me as someone who inspires and I am the 2015 NABJ Emerging Journalist. I was terminated while using my own sick time to care for my dying grandfather. I believe this is because I filed an EEOC complaint the month before. After an 8-month long job search, I still can’t find a full-time news job. Thankfully I have my peace of mind, and I hope in sharing my story — it opens the hearts and minds of readers to affect change. Reporting on race in the newsroom. I was hired at WJTV after breaking one of the biggest stories of the decade. The officer involved shooting death of a teen named Mike Brown in my Ferguson, Missouri neighborhood. His death sparked change and helped ignite the “Black Lives Matter” movement that we know today. However, when I pitched stories about race in Mississippi, I was told the stories “are not for all people.” My boss constantly complained about the “types” of stories I pitched and shared on my personal social media accounts. 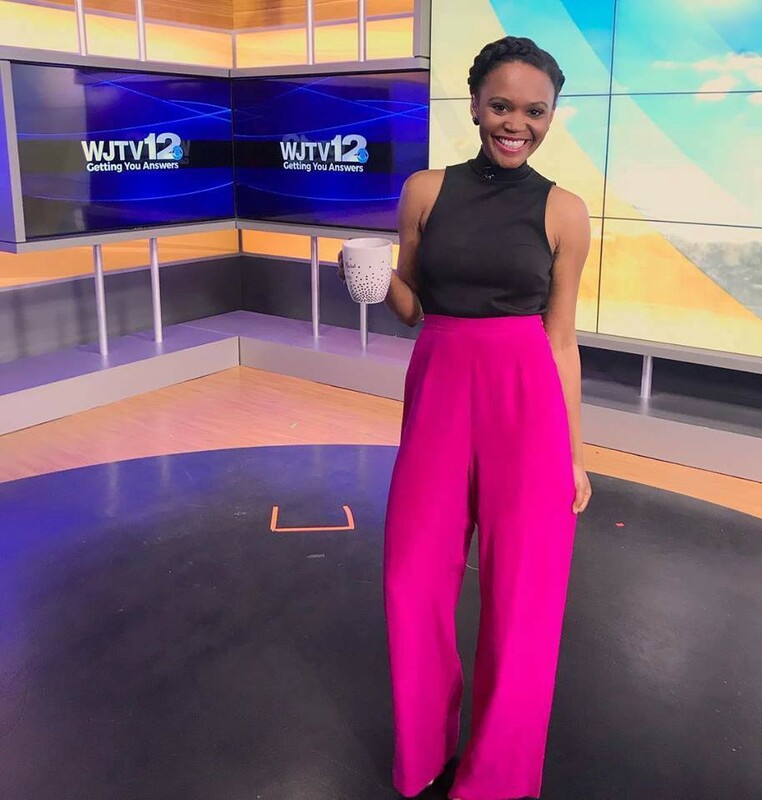 He explained over and over that he didn’t want my brand to grow and denied me the basic necessities to properly anchor “WJTV This Morning,” such as access to review scripts on the desk before I was forced to read them on air. Why I could not wear my hair in its natural state on TV. WJTV is still stuck in 1953. WJTV brands themselves by their “Original Reporting.” Like many news stations that popped up during the civil rights movement, they did not allow black journalists to report when they first began going live. Even today, WJTV does not allow two black reporters to anchor the news together. At the time of my first complaint, 7 of the 12 on-air staff members were black. That means station management goes out of their way when scheduling holiday and vacation requests to keep up us from sitting next to each other on the desk. That became clear to me when President Donald Trump stopped in the city for the grand opening of the Civil Rights Museum when my boss emailed me that I would not be needed for coverage and instead chose a beautiful blonde weekend anchor who has less experience than me. I can not count how many meteorologists I have worked with on our morning show. The station has formed an ally with Mississippi State University creating a pipeline for inexperienced white meteorologists. One day a new meteorologist joined us on the weekday morning show. He had just graduated from college. He came to me about 20 minutes before the show looking for an earpiece, a device you should be fitted for in advance. My new coworker admitted he had never been on the wall and never even practiced at WJTV, before joining our weekday news teams. Jackson is about 80 percent black, but we were not allowed to have a black Santa on TV because “we couldn’t rock the boat.” News stories involving black greek organizations were given little consideration in news meetings because they were just “sororities and fraternities” despite their continuous work to improve the community. Even before my pregnancy, I had problems. One day during the show I promoted a Caring for MS event at the Jackson Country Club. I sent our then community outreach person an email asking if I could have tickets to the event. She told me they didn’t have tickets left but she would see what she could do. I told her if she could only offer one ticket not to worry because I would be bringing my then husband. She gave me two tickets, but only half of our table was filled that night at the country club. I noticed just one black couple at the event. I feel that I am often discriminated against when looking for a “face” to represent the station because I do not reflect their targeted demographic and advertisers. I understand racism exists. My family is still trying to pull ourselves up from our ugly past which can be traced back to slavery. I am the first person in my family to graduate from college. My grandparents were sharecroppers and my mom even lived on the land. But, but it was the way I was treated as a mother at WJTV which forced me to stand up for myself. Why mothers deserve a place to pump milk. After announcing that I was pregnant, I was no longer asked to participate in commercials. I felt the need to starve myself to fit in. I now weigh 108 pounds. I did eat while carrying my son and postpartum, but I noticed my events were given to a white reporter. I was finally allowed to use a storage closet to pump milk for my son 6 hours after my shift began. This came after filing a corporate complaint and a two-month long investigation. To be fair I didn’t feel comfortable asking my news director for a place to pump. I would need privacy every 2 to 3 hours and I was responsible for anchoring from 430 am -9 am. This allowed no time for a break. I was 34 weeks pregnant when my boss told me in a private conversation that I wasn’t a mother yet. The next week I went into labor during the show, likely because of stress. My son was born 5 weeks premature. His lungs hadn’t formed completely, he was rushed straight into the NICU and I wasn’t allowed to hold him when he was born. Within the last month, my baby finally stopped getting breathing treatments 2 times a day, but he does need an inhaler three times a day. I believe my breast milk could have helped him but that’s something I will always blame myself for. Before filing my complaint, I would have called our HR director a friend. We lived in the same town, our kids attended the same daycare and we both are Christians. She encouraged me to file a complaint with Nexstar. Maybe she had no idea the real problems in the newsroom, but from that day on the harassment never stopped. The results of my complaint. I continued as the face of WJTV anchoring 5.5 hours a day. I delivered the news with a smile because I know representation matters. I thought about the little black girls watching before school. I still hoped to be a small ray of hope in Jackson. When the state stepped in. The internal harassment got so bad that I made several trips to the EEOC department begging for help. They finally took my case but warned me I would get fired. I was living month to month at my apartment and renting a car. I never told my co-anchor what was going on. In fact, he kept asking me what happened to my car and why I had a rental but I never let him in on my secret. I know he has a family to feed. My investigator filed his own lawsuit against the EEOC. The EEOC has been investigating my case since April. I began working with Antonio Jones their federal investigator. He would ask questions like “how many white employees have to wear wigs in order to do their jobs?” Suddenly I got an email that Jones would be gone for 2 months. It has come to my attention that my federal investigator had to file his own lawsuit against the EEOC. His case documents allege he made “formal complaints regarding the district director and local director. Both of these directors improperly and illegally closed cases to help out certain employers whereas this reflected receiving kickbacks.” I turned in everything I had to the state hoping they would fight for me. To think the state could actually be working with the corporations and not for the people is beyond disheartening. I would reach out to the EEOC for more information but they are closed due to the government shutdown. It is my understanding that my investigator has been protesting himself. He is an army veteran who was injured in Iraq. While on sick leave- due to his disability- his cases including mine were taken away and he was reassigned to another state. I hope my story resonates with someone. America needs to take care of our journalists, especially journalists of color. We are crucial to democracy. The next post in my series of Reporting on Race in America, I will detail the investigations I was forced to shut down in Mississippi including the hanging death of Willie Jones Jr, Governor Bryant’s possible connection to the Bryant family responsible for the death of Emmett Till, the lack of state support for Historically Black Colleges and Universities, a sit down interview with the previous Mayor in Jackson detailing the problems his administration faced, the questions we could have asked about the only legal marijuana farm in the United States allowed grow the drug for research.